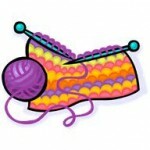 WEDNESDAYS at 1:00 pm – Want to learn or like to knit with someone? Stick with us. We’ll get you hooked! Help is always available.